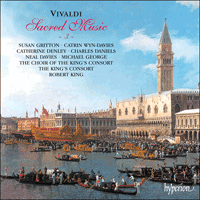 The first release in The King's Consort's series of Vivaldi recordings was declared 'Best Vivaldi Recording of 1995' by the Vivaldi Institute in Venice. With this third volume we present five more large-scale choral works, including the rarely heard 'second' Dixit Dominus and two settings of the Beatus vir. RV597 is the famous one and includes the 'antifona' on the words 'Beatus vir' which recurs throughout the work to such great effect. Domine ad adjuvandum has been justifiably described as Vivaldi's 'most perfect' sacred composition and fully exploits the antiphonal potential of double choirs and orchestras: a work of great panache.